Our unique and industry-leading system is loaded with powerful features to help improve your family's expectant mother outreach. Within minutes of joining, adoptive parents can launch an elegant, professional profile loaded with all of their photos, videos, and blog entries. Start your adoption profile today. Or read our FAQ. Expectant mother visitors can become Adoptimist members too, allowing them to freely, safely, and anonymously communicate with our families. Expectant mother members can follow & save families to a list for easy contact access. Learn more. 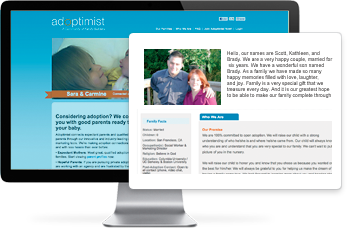 Unlike what you'll find on similar services, Adoptimist profiles don't just sit there waiting for someone to see them. Our system enables families to actively engage in the entire profile-building process. Families increase their visibility toward expectant mother members each time they update their profile. Our expectant mother members can see a list of recent family updates with an option to view the profile, if desired. Not only does this encourage connectivity, it leads to fresher profiles too. We empower our families with valuable statistics about their profile's effectiveness and outreach. Adoptimist members don't have to speculate about what kind of impact their profiles are making. They can simply view their statistics and make informed decisions based upon them. Our families can choose additional advertising and services to help market their profile. We offer Pay-per-click adoption internet advertising, custom domain names (i.e., www.youradoptionsite.com) for profiles, and Profile Analysis / Optimization. We manage every additional service we offer, utilizing our expertise and experience to minimize stress and maximize results. The adoption process can quickly become expensive. That's why we offer membership and advertising options for every budget. There are three plans available (including free) and members can upgrade or downgrade between the plans at any time. Learn more about Adoptimist's membership plans.